Finally a little fall weather and with the season the dinner menus change around here, great soups and stews to be had and we begin with a quick, hearty bowl of New England creamy clam chowder and for me, the Instant Pot was so darn quick once the ingredients are gathered, and with 15-20 minutes of cooking time you have a great pot of soup to enjoy, just top with oyster crackers, seasoned or plain, a bit of seafood seasoning and crumbled crispy pancetta. While you can make chowder with fresh clams or frozen, canned are not so bad and certainly easier to come by in the grocery stores. I usually have a giant can of Sea Watch clams that makes a huge pot so I opted for 3 smaller cans of Bar Harbor brand clams and a small bottle of clam juice for 3-4 servings of chowder. 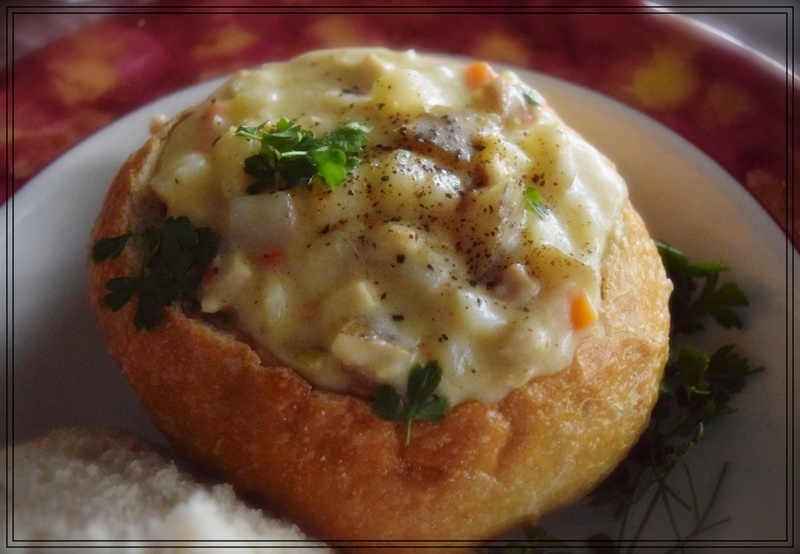 Of course I just had to serve it SF Wharf style, in a bread bowl…I can’t wait to make a pot of our NC style chowder, much thinner than NE chowder. Optional garnishes: Crispy pancetta or bacon, minced parsley, and plain or seasoned oyster crackers.